They say that once you reach Stardom, you change, and that there are some that have ego problems. Well, I must say, I know a lot of Stars now, and have spent some time with them, and find them to all be so very precious. 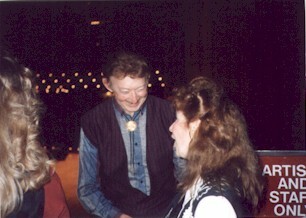 In this picture, Jack Green, the famous singer, songwriter for "Statue of a Fool" and I share some good laughs in-between performances at the Grand Ole Opry.